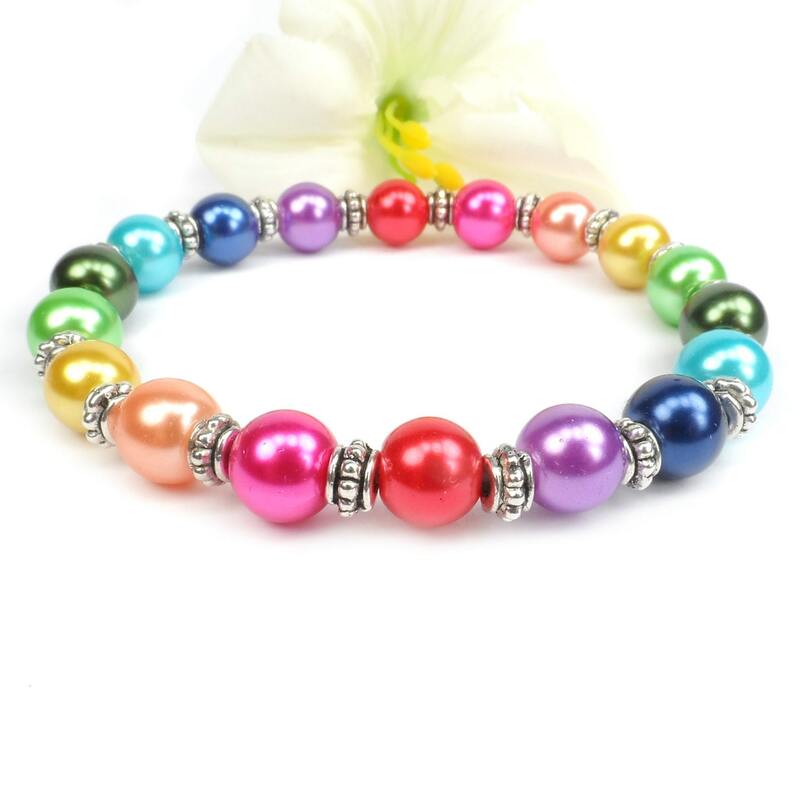 Add some fun to any outfit with our bright rainbow stretch bracelet in pearl tones. This colorful jewelry is great for shopping with friends or night out on the town. Great for stacking with our other bracelets to give that bohemian look. Bracelet is made with 8mm glass pearls in red, pink, orange, yellow, pale green, dark green, aqua, blue and purple and tiny silver accents. We string all of our stretch bracelets twice for extra durability. It is roughly 6 3/4" inside diameter but will stretch to fit most wrist sizes. If you would like other colors or different size let us know we will be happy to design something just for you. We have over 22 colors available. Bracelet comes ready for gift giving in organza bag as shown on last photo. 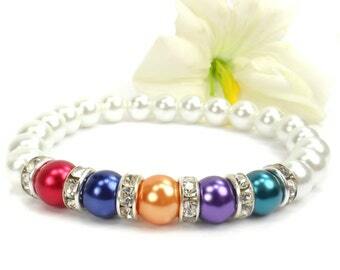 Such a pretty and colorful bracelet! It's also very comfortable to wear. Thank you! Got here fast, thank you! Payment is due immediately at purchase. Once I receive notice that your payment has cleared I will ship your purchase. *All orders to South Carolina will be charged appropriate tax for your city and or county. Because I have enjoyed making each and every piece I want you to be happy with your purchase. Each piece is hand made so items may include areas of imperfection. I want you to be happy with your purchases and will try to accommodate any issues. -You MUST contact me prior to return the item so I can provide you with return instructions. -Returns are accepted on unworn items within 14 days of date delivered. -Buyer will be responsible for all return shipping fees. -All returned items must be in original packaging in unworn/unused condition - no exceptions. -Once we receive your items back and they are inspected we will refund the purchase price (not the shipping & handling) in the form you paid for them as long as criteria is met. -NO refunds will be given for uninsured items that are lost/stolen in transit. -I'm sorry, but custom items are not refundable unless an error was made on my part. -Returns are to be sent back with tracking number to protect buyer and shop. - If you prefer an exchange we will ship your exchange items once we receive your original purchase in unused condition and cost of shipping second item to you. If your item arrives damaged please contact me within 3 days of delivery. Damaged items will be handled on an individual basis and I will offer refunds, credits, or exchanges based on the individual situation. Refunds will not be issued until the original item is returned - no exceptions. I realize that occasionally item do break, if this happens to you please feel free to contact me so we can figure out how to get you back wearing your piece. First 15 days will receive free repairs if fault of ours. We reserve the right to ask for photos and questions to determine why the product broke. If item broke on your doing we will be happy to repair the item for a small fee. Orders must be cancelled before I ship item. If the item has already been shipped, buyer is responsible for all return shipping fees if they wish to cancel the sale by returning the item. *CUSTOM ORDERS cannot be cancelled after 24 hours from date of purchase. I work very hard at making sure customers get exactly what they have ordered but occasionally I do make mistakes in shipping. If you have received the wrong item please contact me right away and I will make it right. Buyer is responsible for purchasing correct bracelet size. Any returns due to wrong size will be charged return shipping fee. Below you will find more information on sizing. I ship daily Monday through Saturday. If orders are in by 10 am EST and are for in stock items they normally will be processed that day. Things do happen and occasionally your order may not be able to go out that day. If this happens you will be notified as to when it will be shipped. Occasionally we do go away from shop but this will be posted in announcements and when to expect shipping is to start again. We offer priority upgrade shipping for a flat rate of $7.05 inside USA. The current check out system charges .25 per item charge for additional items on top of flat rate of $7.05. There is no way around that right now. If you purchase more then one item and choose priority shipping we will refund you any shipping charges over $7.05 back to account you checked out with. Larger orders (15+) may not be eligible for the refund depending on size of package. If your order is a custom made to order item (sports, school, birthstone, gemstone jewelry, change orders or other listed as made to order) please note that it takes an additional 24 - 48 hours for your item to be made and marked as shipped. This will bump your delivery time up to approximately 5 days with priority. This service is through USPS and classified as 3 day priority. However USPS does not guarantee priority package delivery times. In most cases they are delivered in 3 days but occasionally it takes a day or two longer. We can not be held responsible for delays in postal service. Orders within the United States will be via USPS First Class Mail with tracking included. Estimated delivery is 2-7 working days depending on where in the U.S you are located. Although most of the time postal service runs smoothly occasionally there are delays due to weather, holidays or mishandling at postal centers. It does make us unhappy as well but we cannot control these delays. You can check in tracking for when we posted your package and see if there are any delays. Contact us if you have not received your item after 7 days of purchase. Please be aware of what your country's custom VAT fees are as you are responsible for all custom and VAT fees. Shipping from U.S to other countries may take anywhere from 2 -6 weeks. Parcels may be delayed at customs, particularly at busy periods - This is beyond my control. Some countries do hold a higher risk of lost or stolen packages. We can not be held responsible for such loss after it leaves US border. Insurance is available for an extra fee if you would like to purchase please let us know before ordering. We do provide a tracking number that will show it has went through our US channels and then again when it has been delivered in most countries. Contact us if you have not received your item after 21 days of purchase. Items listed as ready to ship will be shipped within 24 hours or sooner after cleared payment. Birthstone jewelry, change requests- sizing or adding of beads, charms may take up to 48 hours to ship. You can contact me to ask time frame before purchasing. Please make sure you leave a working email. If we need additional information for your custom order we will contact you. If we can not contact you after 3 days we will cancel your order until further notice. Any order without color choices will be put on hold while we try and reach you. We can not assume you want the one pictured as there are usually several pictured in our listings. Please know that if your purchase shows it has been delivered through tracking and you have not received it, it is your responsibility to track down with your post office. I will try and help you to get it resolved to the best of my ability. I cannot be held responsible for stolen or misdelivered items. PLEASE make sure your address on file is correct. Buyer will be responsible for any additional shipping costs incurred due to returned items and reshipping if their address is incorrect. any product purchased from A Beaded Story. By purchasing products "A Beaded Story" and its owners are released from any and all responsibility. Our jewelry is considered upscale costume jewelry. Our products are not real diamonds, pearls, silver, gold or other gemstones. We do not advertise as such and it should not be assumed. We do state they are imitation glass pearl, crystals, silver plate or Tibetan silver. To insure long life of your jewelry please take care in wear of items. Wearing in water, harsh chemicals, cleaning products, sweat, suntan oils, chlorine and dirt may harm your jewelry. If the silver plated parts become tarnished you can polish with polishing cloth but do not use cleaning chemicals. 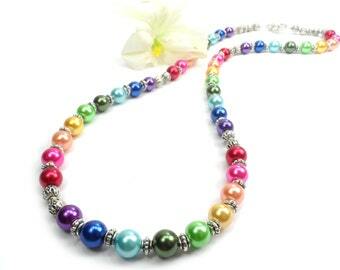 Our glass pearl items will scratch if put under stress conditions. We do not recommend wearing them while working outdoors, labor work or any rough situations. We can not be held responsible for misuse of our products. ***Bracelet sizing is subject to slight variance on custom orders due to number of beads. Everyone's monitor is different and colors may show up slightly different for everyone. I do my best to describe the item but be aware of the color differences in monitors. Using a flexible measuring tape*, Measure just above (towards elbow) the wrist bone, then add 3/4" to 1 1/4" (1" is average) depending on how tight you like your bracelets to fit. That is the size bracelet you would wear. X large - 8 1/4"
All our products arrive in an organza gift bag ready for gift giving. If you are sending this item as a gift we would to include a gift card for you. At check out in the comments to shop section type " Gift" and sentiment you would like on card. We love custom orders! If you don't see what you are looking for or would like a change on our listed items just drop us a note. We will be happy to work with you to create your dream piece. We ship daily Mon. - Sat. If order is in by 10 am EST we try to process them that day. Things do happen and occasionally your order may not be able to go out that same day due to unforeseen circumstances or higher volume times like the holidays. if this happens they will go out the next business day. Order may take up to 3 days to complete before processing. Please allow additional time during busy holiday times. Orders within the United States will be via USPS First Class Mail with tracking included. Estimated delivery is 2-5 working days depending on where in the U.S you are located. I NEED MY ORDER RUSHED. CAN YOU DO THAT? Yes we offer 3 day priority shipping through USPS for customers in the US only. You can add it at check out. Not a problem. Contact us with item and how many you need. In most cases we can duplicate item as long as we have supplies on hand.